You can start by clicking on the Callnote desktop icon and by adjusting the settings in Recording Options -> Facebook tab. After you’ve adjusted the settings for the screen recording session, you can start a video call on Facebook. We would recommend you to use Chrome or Firefox browser to access to either Facebook’s desktop website or their messaging app called Messenger. Make sure that your webcam and microphone are properly plugged in and working. If you’re using your web browser for the Facebook call, pop-up blockers might interfere with the call, and unless you’ve enabled your browser to access your cam and mic, the other person will not be able to see or hear you. Start the call and then simply hit the Record button to start capturing audio, video, and pictures from the screen. Callnote records your screen as you see it during the call. Pause or stop recording at any moment by clicking on the appropriate buttons on the Callnote widget. Callnote doesn’t have any recording time limitation, at the same time please mind that with pressing the Stop/Start button the recording will resume with the new file. Once the recording is complete, the audio or video file you’ve created can be edited, saved, forwarded or transcribed. Recorded videos are saved in Library as MP4 file which would be easy to playback on any video player. In-built audio and video editors offer cutting and trimming tools, as well as a rich selection of annotations. A wide range of integrated Clouds makes it easy to export the recording, post it on your Facebook page or YouTube channel. Go to Sharing Options Tab to set up the forwarding. In-built automated transcription service allows transcribing your audio file to text in just a few minutes. Generated texts can be used as captions while posting the recorded video on Facebook. Try also our emotion recognition tool which can detect smiles, surprise, dislike, attention, and drowsiness. So, you can see the conversation emotional results displayed in graphical format. 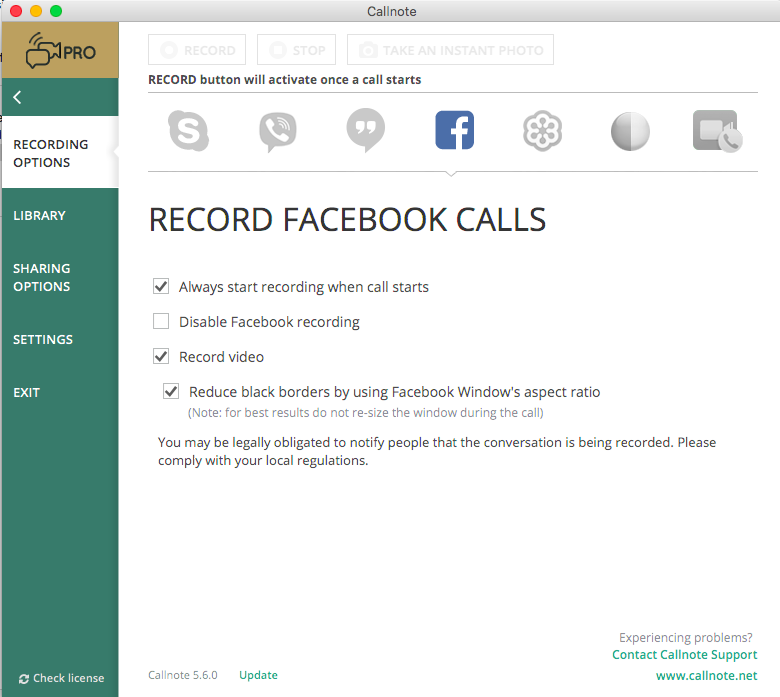 Callnote Messenger video recorder is your best way to capture Facebook video calls on Mac and Windows OS. Try it now with our Regular free package or upgrade to Premium or Pro to get access to HD recordings, editing, and transcription features.